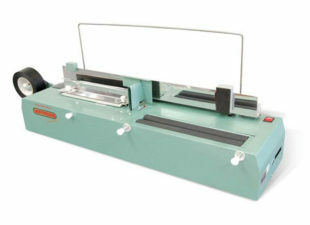 High Quality Spine Taping Machines from Total PFS. We have a price match guarantee on all our spine taping machines so if you have found the same spine taper or spine taping machine at a better price then let us know and we will match or beat it! Matador 330 Spine Taper makes spine taping pads and books faster and easier with automatic centralising and cutting of the spine tape. Loads standard 50m rolls of spine tape.